No matter how good these bowhunting stand locations might seem, don''t get sucked into their trap. This tempting location probably claims more victims than nearly all the others combined. Even experienced hunters can fall for its raw appeal. 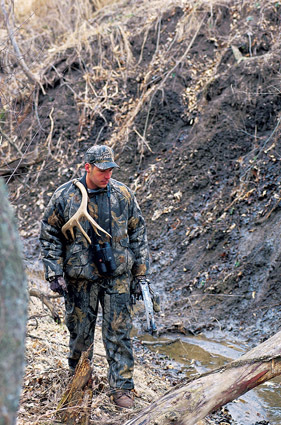 Here's how this site casts its spell: You're scouting for a stand that will work during the rut. One good choice is a funnel between two bedding areas used by does, so you look for just such a perfect buck trap. In rough country, bedding areas are typically on points and short ridges overlooking large ravines or valleys. They're predictable sanctuaries and will show heavy signs of bedding activity everywhere they're found. When crossing the ravine to check out the points on the other side, you'll invariably notice some tremendous trails crossing the bottom. They cut deeply into the soft earth where several trails come together to cross the ditch. Wow! A mother lode of sign! At first glance it appears to be a great funnel between two bedding areas, made even better by the fact that you can sneak up the ditch to get to the stand. They'll never know what hit them. You've just stepped into the snare that's going to make you miserable and ruin what could have been a great area. It's darned tough to walk past such an obviously-attractive location without spending a half hour looking for the perfect tree to place a stand. But, hold your horses for a minute. What's going to happen when the wind blows, or worse yet, when it gusts? Your scent is going to wash all over that ravine until every deer within a quarter-mile radius knows you're there. That's not going to help them feel very relaxed and comfortable around home, is it? From the number of stands I've seen in ravines while I'm scouting, it would appear that many bowhunters fall victim to the tremendous sign found in these places. Remember this rule of thumb: If the spot you are considering is protected from the direct flow of the wind by features of the terrain, it is not a dependable spot, regardless of how much sign you find. There are definitely better places to hunt the deer that made that tempting sign. The ravine crossing is a seductive spot, but it's one you should walk past. Most of us prefer a stand that's easy to travel to, over one that requires a GPS, reflector pins, and maybe even a bit of luck to find. Some bowhunters are comforted when they roll out of bed in the morning to know they are heading for a stand they can easily walk to. They may even go out of their way to hunt only such spots—and they pay the price. I have a friend who loves the easy stand. In the back of Ron's mind lurks the ever-present fear that he will get lost in the dark woods and end up spending his entire morning hiking up and down hills, trying to find his vehicle. As a result, he makes many mistakes in the type of stands he hunts. And, they are deadly mistakes for old Ron. The classic blunder occurs when he chooses to approach his morning stands by walking directly across open fields. Typically, in the agricultural country where we hunt together, that means he's walking across a harvested crop field—a feeding area. And, where do you think the deer are going to be a half hour before first light? Right! Either they're still out feeding or on the very fringe of the cover, picking their way slowly toward their bedding area (and maybe toward one of my stands). When my buddy Ron rams right into them, all bets are suddenly off. On one ridge we have treestands placed about 100 yards apart. It takes me about an hour to make my entry the back way (away from the feeding areas), while staying in the timber and using ditches, draws, and creeks to get to my stand without spooking any deer. It takes Ron about five minutes to drive his ATV along the edge of the field, walk the remaining 150 yards across the bean field, and then 100 yards through the woods to his stand. Sure, his approach is a lot easier than mine, but he may as well stay home—that's easier yet. 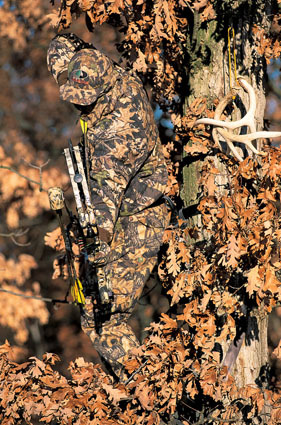 Don't fall victim to the temptation to take the easy route to your stand areas. If you are thinking about hunting a morning stand and plan to walk across a feeding area to get to it, do yourself a favor and reconsider. 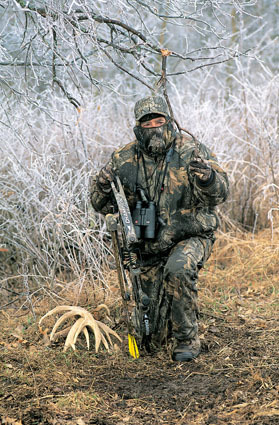 In the first place, there is no such thing as a "hot" scrape during the peak of the rut. Bucks don't use them then—at least not with any consistency. Beyond that, we need to resist the temptation to become too sign-oriented. Granted, buck sign sets our imaginations to churning, and we soon envision thick-necked bruisers ripping up a tree trunk or pawing dirt like some antlered Brahma bull preparing to charge. Yet, despite its affect on our imaginations, buck sign can be a seductive killer. Rarely is it a useful indicator of a great stand location and never is this more true than when you decide to sit over a scrape during the peak of the rut. Admittedly, I've been sucked-in by big scrapes many times. I remember an entire season more than a decade ago when I hunted them exclusively. All my spring scouting had been focused on finding the biggest and best scrapes on the farms I had permission to hunt. That year, for a full two weeks of hunting during the rut I never saw a buck actually freshen one of those scrapes. In fact, most of them became covered with leaves as I stubbornly waited for the buck that made them to return. I became so discouraged that year that I vowed never to hunt a scrape again. And, I've pretty well stuck to my guns. Once the rut peaks, bucks are far too busy chasing and bird-dogging does to worry about freshening scrapes. If they do hit one it is purely a chance event. Sometimes they just pass through and come upon it—they'd be there with or without the scrape. Once the bucks start chasing does, I stop intentionally hunting scrapes. There may be a time in late October when bucks actually go out of their way to hit a scrape and make them worth hunting, but during the rut these patches of pawed dirt are worthless. It will also distract you from hunting the doe concentration areas and the travel routes between them, where the bucks can actually be found at these times. Unless you have located a good scrape line and plan to sit above it long before the does come into estrous, you are reducing your odds by focusing on scrapes. When you scout your hunting area, keep your eye on the ball: terrain, bedding areas, feeding areas, and the best funnels you can find—and forget about scrapes. I love hunting along ridge top bedding areas during the morning, but I've stopped hunting them anymore during the afternoon. I've tried, and I'll probably try again. And, I'll come away with the same conviction: I just wasted a good afternoon hunting a dead area. It's not like bucks don’t walk through the bedding areas in the afternoons looking for does—they do, but not for very long. The real action is already up on its feet and walking toward a feeding area. Hunt the places the deer are moving toward, not the places they are coming from. This simple philosophy can nearly double the length of time the deer are active around your stand. Suppose the deer get up from their beds an hour before sunset and start drifting toward their feeding areas. You have a brief flurry of activity and then everything is moving away from you. Within a half hour everything is pretty well finished in the area near your stand. That little dab of activity is just not worth the risk you take of bumping and educating deer when you try to enter the stand spot. That brings up the second reason why you should skip bedding areas in the afternoon: it's nearly impossible to approach them during the day without blowing the hunt. Deer don't pick their bedding areas randomly—they are the safest places within their home range and where they have the ultimate advantage. Your approach can either be seen or smelled by every deer within a pretty large area. You might as well just drive to your stand on your four-wheeler, trailing 10 feet of your dirty laundry behind. These are my favorite morning spots. You can sneak in easily while the deer are close to their feeding areas and be waiting for them. But don't let the great action in the a.m. tempt you into thinking these are good afternoon stands. You'll be sorely disappointed. The temptation to hunt your best morning and evening stands as soon as the season opens is almost irresistible. I used to do it, but discovered it's another deadly mistake. Accelerating the education of your deer well before the rut means they will be tougher to hunt when prime time finally arrives. It is only natural after being away from the hunt for several months to want to jump right into it with gusto. On top of that, you're accustomed to a normal hunting day that includes a morning and an evening session. Unfortunately, there are few spots for a decent morning hunt during the early season, other than in a bedding area. The desire to hunt mornings will have you invading bedding areas without a clear idea of their patterns at a time when the deer are living fairly close to home and highly sensitive to hunting pressure. That's not such a good idea. Ramming around in bedding areas early in the season may seem logical on the surface (where else are you going to get them in the morning? ), but the damage you can do to your hunting area and your odds later in the season outweighs the benefits of being in the woods a few more hours each day. Besides, if you keep them acting naturally and on a pattern, you'll have a decent chance of taking the buck you want in the evening by hunting only where he feeds. When deer are in feeding patterns, concentrate on your home-front honey-dos in the morning, so you'll have them out of the way before the rut. Instead, focus all your efforts on hunting the feeding areas in the evening. You can pattern them from a distance, producing almost no impact until you move in for the kill. If that honey-do list is already complete, spend your mornings watching the deer leave feeding areas from a distance. This will give you the best possible feedback about where the bucks will be found that afternoon. If you insist on hunting in the morning, definitely stay away from your best areas and hunt bedding areas in places that you don't plan to hunt much later in the season. I hunted the Milk River in northern Montana a few seasons back. It's a river bottom with very limited cover, most of it located inside the river bends and in low swampy areas nearby. The bucks are very visible from the bluffs overlooking the river and we spent our mornings watching them leave the alfalfa fields so we could peg the trails most likely to produce action when they came back out in the afternoon. It would have been hunting's version of suicide to sit back in those river bends in the morning. Sure, we might have gotten lucky and picked off a buck when he came back to bed, but the impact more likely would have pushed them into the surrounding coulee country or at very least made them nocturnal. 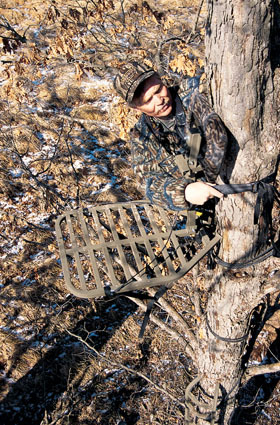 Four or five bowhunters may hunt that stretch of river during a week, but almost no one actually sits in a treestand during the mornings. The odds of ruining whatever feeding patterns we've been able to uncover are too much of a risk. We focused on the easy patterns (where they feed) and forgot about the hard patterns (where they bed). 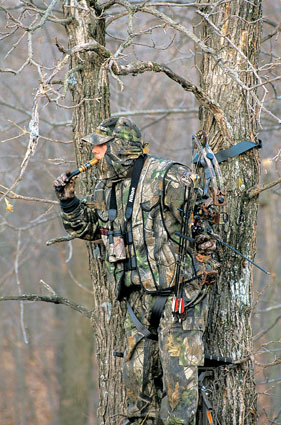 It's good advice for anyone hunting early-season bucks.